THE BAKERY, 1670 Franklin Street, Vancouver. Emily Hermant is an interdisciplinary artist whose sculptures, drawings, and installations explore themes of communication, gendered labor, and the spatial experiences of the body. She received her BFA in Studio Arts from Concordia University in Montreal, QC, Canada, and her MFA as a Trustee Merit Scholar in Fiber & Material Studies from the School of the Art Institute of Chicago. Her work has been exhibited in museums, galleries, and festivals in Canada, the United States, South America, and Europe, and has been featured in LVL3 Media, ArtSlant, Espace Sculpture, The Washington Post, and TimeOut Chicago, among others. Hermant has been awarded grants from the Canada Council for the Arts and the Conseil des Arts et Lettres du Quebec, and artist residencies at Haystack, ACRE, Ox-Bow School of Art, The Ragdale Foundation, Nordic Artists Centre, and the Vermont Studio Center. Hermant is currently based in Vancouver, BC, where she is an Assistant Professor of Sculpture + Expanded Practices in the Audain Faculty of Art at Emily Carr University of Art + Design. Surface and texture are fundamental elements in Hermant’s work. Her pieces communicate via materials that are layered, bent, or constructed. An accumulation, or slow build-up of materials, creates a pattern or overall surface texture. Her piece Thumbpins—an older work from 2007— arranges 70,000 dressmaker pins to whorl a thumbprint on the gallery wall. These pins are integral to the work of a dressmaker, but unseen and perhaps unappreciated by a consumer of the dress. Hermant utilizes unseen everyday objects, recast from their original roles, as components of large, complicated systems that create unique textures to communicate ideas. Indeed, the viewer enters the idea through the texture. From a distance, an image is recognized without the material being detected. Nearer to the piece, the viewer separates the layered components that create texture and image. Hermant takes a single material and repeats it over and over again to render an image, pattern, or texture. The object, or material, then breaks apart to create a bigger image. The communication of the work happens through repetition and tactility - an intense build-up of surface. This labour is a way of knowing and form of knowledge that guides her through the act of making. The repetition of small, simple materials creates large, complicated images. Mirroring that, the material itself - such as dressmaker pins or telecommunications wires - are small components that support the creation of integrated and complex systems, such as: a tailored garment or wi-fi network. The materials she selects are intentionally ordinary - they’re everyday objects used readily, but their unique labour isn’t realized until viewed in a different context. The pieces in the show, Reflections on Perseid (No.1), Reflections on Perseid (No. 2), and Reflections on Perseid (No. 3) are all constructed from cut and rearranged telecommunications wires, an invisible aspect of our current landscape and ecosphere. Hermant had been searching for concrete methods for mapping out wi-fi patterns, signals, and other elements of the invisible clouds of information that surround us. What would they look like if the world paused and the information was given colour and a body? Their new iteration is bright and physically dynamic. Telecommunication wires are thrown out in mass quantities. The scale of electronic waste is staggering. Hermant salvages digital debris from junkyards, hauling wires coiled in huge bundles and stacked in baskets. Transmission systems and communications systems exist in a virtual world, but remain grounded in physical infrastructure, providing the concept that links the body of work. The largest piece in the show, Reflections on Perseid (No. 3) has an intricate level of detail that registers differently, depending on the distance of the viewer. From afar, it’s a very different image; as the viewer approaches, the images break apart and the slips between the rows and layers of wires become visible. The ends of the copper wiring mimic the glint of starlight or constellations. All the pieces emerge from mapping the shifting patterns of light and space with an attention to layers of interruption. The interruptions, or glitches, become both surface and structure to the work. Hermant is continuously inspired by textile artists who pushed what textile art could be and by post-war women sculptors working with abstraction. Beginning in the 1940s/1950s, with Anni Albers, Gunta Stölzl, and the movement of the Bauhaus weavers, to The Art Fabric movement of the mid-1960’s with artists like Magdalena Abakanowicz, to post-minimalist artists like Jackie Winsor, up to 1970s West Coast feminist work with artists like Senga Nengudi. Hermant continues to resonate with spatially-oriented fibre artists and process-oriented sculptors from these periods who developed radical new concepts of sculpture. The process in Hermant’s work involves intense repetition and long periods of time, but both are necessary labours for the work to be realized The tension between resisting the intense level of concentration and the necessity of making the work drives her practice. This way of making, like stitching or embroidery, doesn’t require a single stitch – five hundred stitches create progress. The repetition is a necessity for the making. An idea may demand a certain material or a material may crystallize an idea. Inspiration runs on a spectrum. Sometimes, Hermant discovers a material and its history interests her - how does it behave? How does it misbehave? What happens when it’s manipulated this or that way? Ideas are generated from play. In other cases, the concept comes first. Materials cut from everyday use lose their original purpose and power. In their former life, they existed with the responsibility to undertake a form of labour or carry specific shards of information. Materials removed from their intended spaces and layered or arranged in different ways may not transmit the way they used to, but they continue to carry data. In this way, Hermant moulds communication, weaving the history of a material’s use with the ingenuity of a new pattern to create complex textures of information. Knowles encourages the viewer to access her work with shared intimacy and sympathetic attentiveness. She received her Masters of Fine Arts from the University of Victoria in 2008 and her Bachelor of Studio Arts from the University of Guelph 2001. She has exhibited her work in solo exhibitions in the United States, Europe and Canada. Group exhibitions include such venues as Vancouver Art Gallery, Night Gallery, Los Angeles, Charles H. Scott Gallery, the Western Front, Or Gallery, and Unit Pitt. Knowles has participated in residencies in Germany, Denmark, and recently Minneapolis, Minnesota. She has been the recipient of grants from Toronto Arts Council, the Ontario Arts Council, British Columbia Arts Council, and the Canada Council for the Arts. She is currently a Faculty Instructor at Langara College and her works have been included in numerous private collections. The show highlights three wall mounted and three free standing works. Three glass works, Walking Spectrum I S17, Walking Spectrum II i) S17 and Walking Spectrum II ii) S17 sit between two-three inches off the wall, which leaves space to throw light and allows the viewer to see down the side. Each work has punctures or openings that sprout bits of refuse or paper material. The process to compose the pieces begins with documenting colours and materials and sites in transition while walking in the city. Shen then sifts through the images documented, samples colours, textures and shapes that presented themselves in the images and beings to collage them back together. She starts off with square samples taken from each neighbourhood photo: images of the skyline, textures of buildings, signs, foliage, and even to what is under foot on the street. These sampled sections move left to right or up and down to mimic the aim of the camera, which allows for the location of the sky down to the street to remain intact. With the distinct batches of city street scenarios laid out, specific colours from within each sampled section are isolated. These swathes represent what is now the spectrum of colours overlaid on one another that compose the collage. This digital collage then becomes the subject for photographing, but this time through a specialized glass lens that creates a kaleidoscope-esque fracturing of image; refracted, even the common bead or ribbon divides into lines and becomes spectacular. This technique references the parallel nature of the references sites that are being developed or otherwise changed. The future is uncertain and often fragmented. The city is being rezoned and divided beneath the lens of its own kaleidoscope.The final fractured pattern is used to develop the window panels. Historically, some stained glass windows in cathedrals incorporated narratives drawn from religious sources to deliver representative imagery. 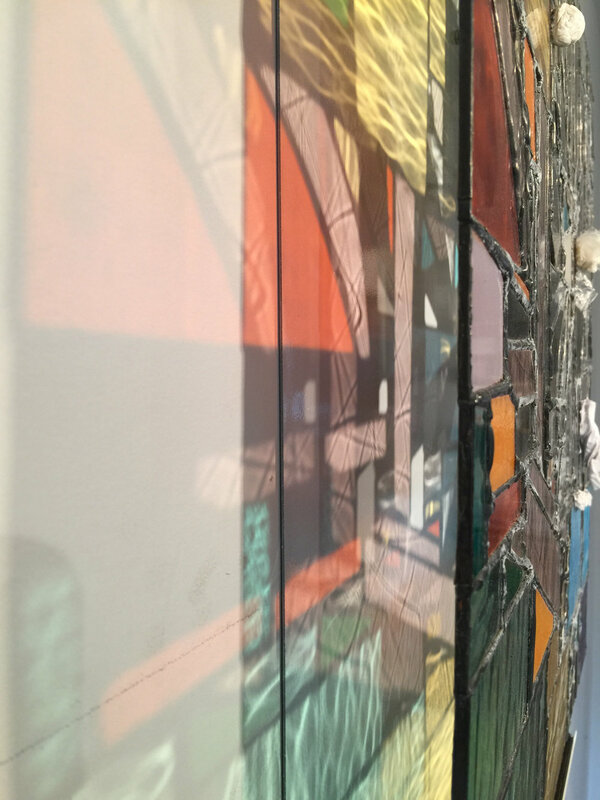 Knowles’ experimental glass works also incorporates narrative but, of the abstract nature of a physically changing city. Knowles picks up material as she moves through the city and incorporates both the physical body and colour spectrum into the pieces. These respond to a timeframe and specific site during a previous summer season. The neighbourhoods offer their unique palettes of colours, such as: yellow flowers, dirty pizza trays, fallen leaves, or cobalt blue bands abandoned by their owners. She photographs buildings, and their surrounding areas, slated for demolition or transition. It’s a capture of the city’s colour palette during a time of intense change. She gathers components of this moment from a referenced site and reinstalls them as a tonal snapshot; the site may offer a different colour scheme or be unrecognizable by the turn of another season. During a period of intense transition and development, each arrangement of colour is fleeting. Due to the combination of seeing their city dismantled and the potential uprooting that comes with that, dismayed people often dump their garbage on these interim sites that, by appearance, are in a moment of belonging to no one. In addition, Knowles observes a habit people have at bus stops of crinkling, rolling, and tucking garbage into slots in benches or garbage bins. It’s a method of coping with the anxiety of sitting and waiting. The palettes capture that sitting, waiting, and processing. The glass and material collages crystallize the reality of the current nothingness and prepare for what the future brings. Orange snow fences are spreading through Vancouver like an invasive species. These plastic safety fences surround sites slated for development or demolition. The psychology behind them indicates that they’re a tonal shift in the landscape to prepare people for coming change. Generally, they surround the site for a year. The colour and implication lead to feelings of unease or hostility, because on some level they are associated with upheaval. The rezoning signs staked in the yards of apartment buildings or family homes are familiar blocks of blue and white. To those without housing security, like renters, these colours can be associated with the anxiety of instability. Everything feels like shaky ground. These particular combinations of colours, the orange snow fences and blue rezoning signs, sprouting as fast and frequent as dandelions, may not exist with this speed and abundance in the future. The city’s moments, on the timeline between when something is bought and will be demolished, are fleeting. The three free standing works, Standers I, II, and III, are tall, bent figures or natural figurative objects in steel bases. They gaze down or turn aside, a memory of the weight their flower heads shaped them with. They capture a moment of gravity. These figures are derived from the stalks of Russian sunflowers, who grew in a row before a rezoning sign. Knowles spent a year observing them dying on her commute. Their heavy heads shaped their twisted bodies; the higher they extended, the more fragile the stem holding up with flower became. The tall vertical throw of the stalk is offset by a space, an in between, a loss, an emptiness, a void, or a memory. They’re seasonal figures vulnerable to the transition of the seasons and weight of growth. The bases are cut and welded steel with a pattern sandblasted onto the surface that resembles petals or the shadow of a flower. The flowery footprint comes in and out of focus, depending on the position of the viewer and light available. This relationship of space, light, and movement is a shared premise between the bent figures and glass collages. Things take time, but in our productivity obsessed lifestyles, we may not understand or relate to the old idiom. The glass work is time expensive and labour heavy, but they reward maker and viewer with distinct tangibility and a bright performative aspect. Sunflowers take time to attain height. They grow, naturally out of the world, and are steadfast in that labour as the space around them is pricked by fences or demolished. 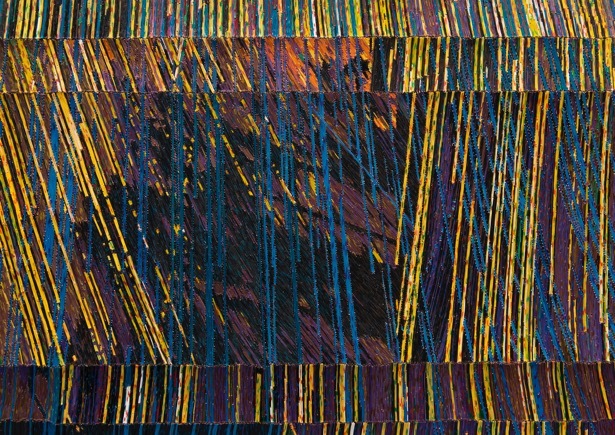 This relationship to colour, movement, and change threads through Knowles other works. She considers human impact, materials, movement, colour and the results of the infinite combinations. Sometimes nature or animals carry colour or change the landscape. She reflects on, and documents, how change occurs and what machinations push it into being. These tangential results discuss our presence, our innovations, but don’t point directly at them. She sees these connections more and more now. It feels like the season of construction or dismantling - and it’s faster than our regular seasons. The two time frames pulse against one another.